The Movelite awning, which is made by West Yorkshire based “Outdoor Revolution” is ideal for a couple of adults and packs away in to a small holdall that can be stored under the seats. It will fit on either the side of the Bongo (using figure-of-8 channels, or on the rear. We asked Val Clark to report back on how easy it was to put up for the first time user. Sunday 11 May 2008- Conditions Perfect. Erecting the Movelite was going to be a challenge for novices like us. To begin with very little information was given, from colour coding, diagrams etc were vertially non existant. It requires 2 people to do this job. Once the two main frame poles were put in place we seemed to get the hang of it. Total time taken on our 1st attempt 1.5 hours. This included all the guy ropes, tent pegs, ground sheet and inner tent put in place. The final task, to bring Bessie Bongo along side was easy. 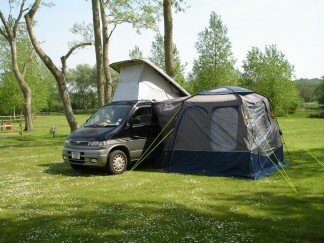 Size wise this awning is ideal for 2. Compact, not too heavy to carry, stows away well. Not sure how it would stand up in high winds or a storm, but very pleased with our new purchase so far.